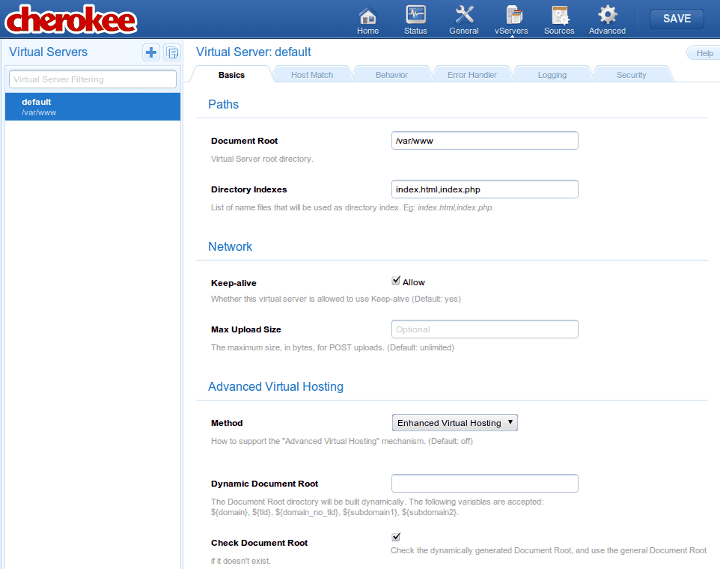 Cherokee currently support a mechanism by which a single virtual server can handle many different domains. The document root of this virtual server is built dynamically, so even if the domains share a common configuration they can use a number of different Document Root directories. The template subsystem is sophisticated enough to provide slicing support, with a grammar that is heavily inspired in the Python syntax. It supports positive and negative indexes, and the omission of one of the index numbers. This basically allows to define partial replacements for any of the supported variables, meaning that a portion of the replacement string can be used instead of the whole string. Indices start at 0, and [x:y] denotes a range comprehending from index x (included) to index y (excluded). If negative indices are used, the count starts backwards from the last element, meaning -1 will be the last, -2 will be the previous one and so on. From the beginning of the string until the last character (not included). Since 0 is the first character, counting backwards one element would be the last element of the string.